I recently bought a copy of DC/Rebellion's edition of Alan Moore's and Jim Baikie's SKIZZ, a minor work from the period in which the "British Invasion" at DC was just starting. It's a competent work with some touches of the usual Moore wit. The main characters, Skizz (the alien) and Roxy (the teenager who finds him), are convincingly handled, but the remaining characters aren't very fleshed out. I had read the work some years ago, and therefore wasn't very disappointed by this re-reading, I already knew that this wasn't as good as THE BALLAD OF HALO JONES or the work Moore was doing for "Warrior" magazine at the time. One thing I noticed this time, and which I don't know if it's a problem exclusive to this edition or if it's something carried from the previous collection published by Titan Books in the 1980's, is that the book omits a page from the original serialization in "2000 AD". I noticed that one chapter was noticeably longer than the other chapters, went to look at my library of "2000 AD" scans (kept, ahem, strictly for research purposes), and found that yes, one splash page from issue #329 of "2000 AD" was left out. This page should go between pages 88 and 89 of the DC/Rebellion edition. 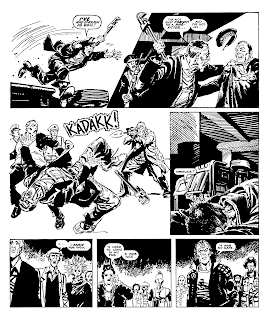 Page 89 in this edition also alters some of the dialog in the first panel. 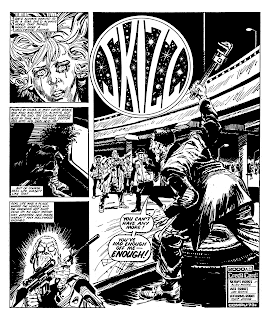 As a public service, the first two pages of the "Skizz" chapter in 2000 AD #329 are included here.